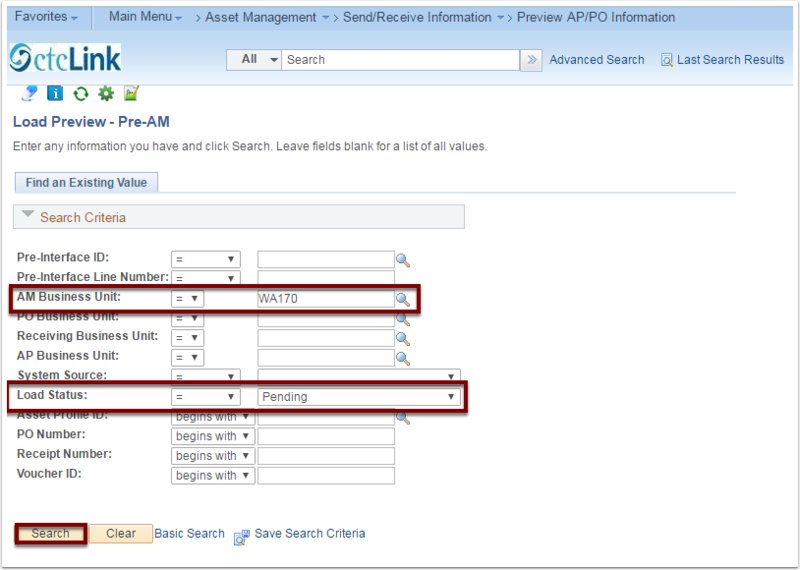 Review the Pre-AM Interface Table for pending assets. Filter search to your college’s AM Business Unit and by a Load Status of “Pending” to isolate those items. 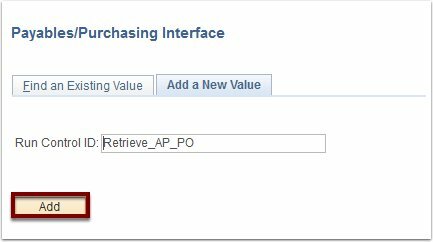 If Pending items exist, run the Retrieve Info from AP/PO process. Enter an existing Run Control ID or click the Add a New Value tab on the Load Assets Request page to add a new value. Enter a meaningful Run Control ID for the accounting entry creation process in the Run Control ID field. Note: A Run Control ID is an identifier that, when paired with your User ID, uniquely identifies the process that you are running. The Run Control ID defines parameters that are used when a process is run. These parameters ensure that when a process runs in the background, the system does not prompt you for additional values. This process will move any Pending items in the Pre-AM interface table to the AM Interface Staging table. The screen shot below shows it being run for all pending transactions. 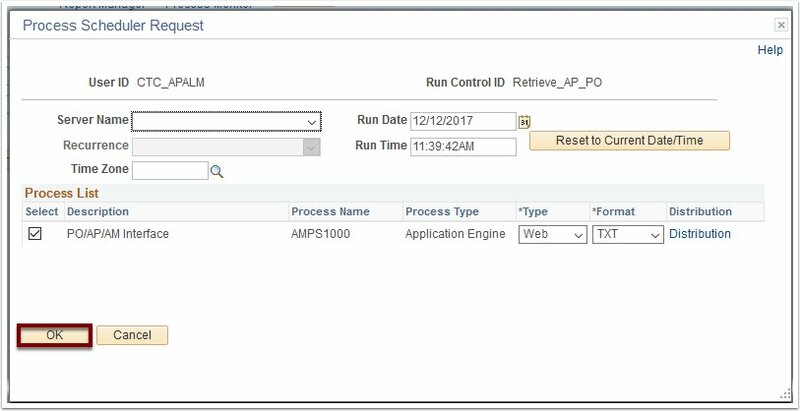 Use the Retrieve Info From AP/PO page to enter the request parameters. These parameters will be used to define the processing rules and data to be included when the process is run. Enter an appropriate value in the Request ID field. Enter an appropriate description in the Description field. Use the Process Frequency drop-down button to select the ‘Always Process’ option. Use the Process Option drop-down button to select the ‘Process All Pending Entries’ option. Use the Process Scheduler Request page to enter or update parameters, such as server name and process output format. Use the Server Name drop-down button to select the appropriate processing server for the request. Note: You can leave the Server Name field blank. Note: A Process Instance number appears when the screen refreshes to the run control page. This number helps you identify the process you have run when you check its status. Select the Process Monitor link to check the status of the process. The process has finished successfully when the Run Status column indicates 'Success'. Once the Retrieve Info from AP/PO process finishes, review the staged assets in the asset interface tables, and, if they are correct, complete the Load Transactions into AM process to create the assets in AM as explained in the QRG Review and Load AM Interface Data- 24a.